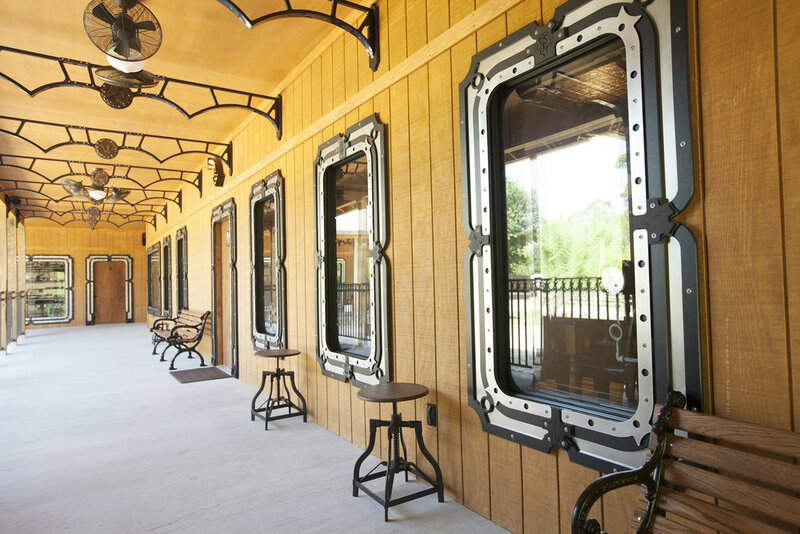 When the Hattiesburg Children's Zoo needed to build a new exhibit house and entertainment space with a Steam Punk flair, they came straight to us. The zoo building houses a tortoise enclosure on one side, a reptile area on the other and a large meeting room / event space in the middle. The large fenced in lawn is attached to the toirtoise enclosure as an area for them to wander. 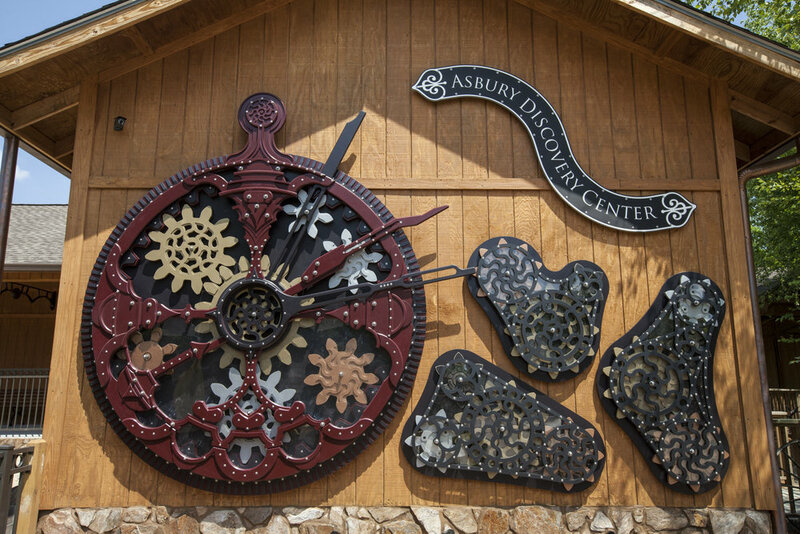 This building inside and out is where we added decorative and functional elements to make this so much more than just an animal exhibit. After realizing the design, we researched and used exterior grade materials in interesting ways. Having to survive a climate that gets both snow and intense muggy heat, we combined plastics intended for outdoor play structures with aluminum, brass and exterior woods. A large window looking into the tortoise house. Here they can take shelter from the elements and get a nice soak in their pool. 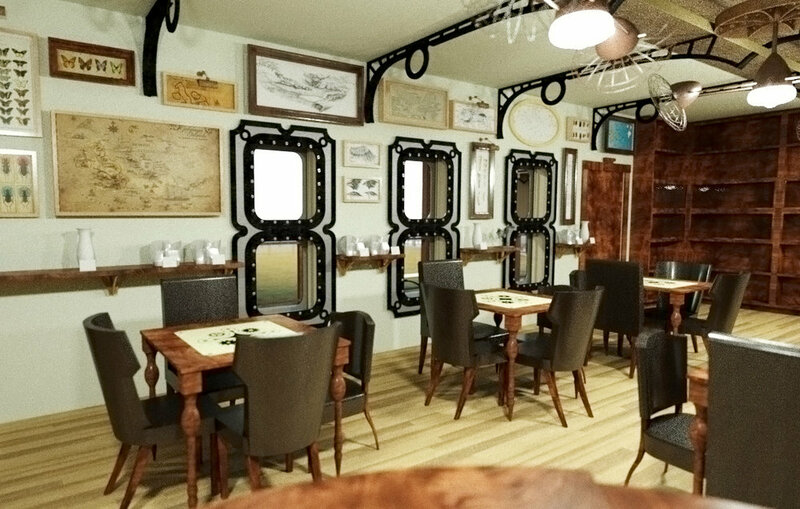 This room we designed to look like the "engine room", complete with faux pipes on the ceiling and a large roatating wheel. 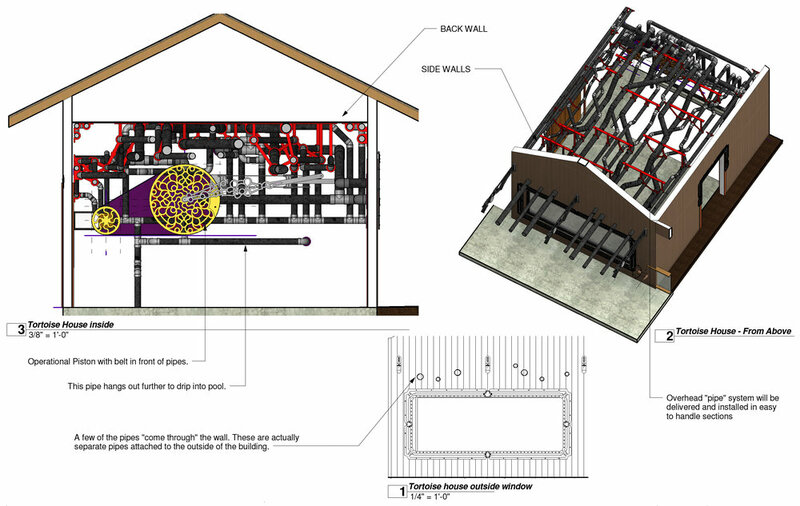 Designed to look like an engine room, the ceiling and back wall of the Tortoise House are covered in pipes and an electrically operable piston. The pool for the tortoise to soak in sits below a decorative ceiling of pipes. Some of the pipes are being used to run water and drip water into the pool, as the large tortoise likes that. From the tortoise house, one can look out the big window to the covered walkway, or go through the tortoise door into the large tortoise roaming field. The covered walkway views the tortoise roaming ground on one side and animal enclossures on the other. Arches overhead have center medalions of animal depicted. 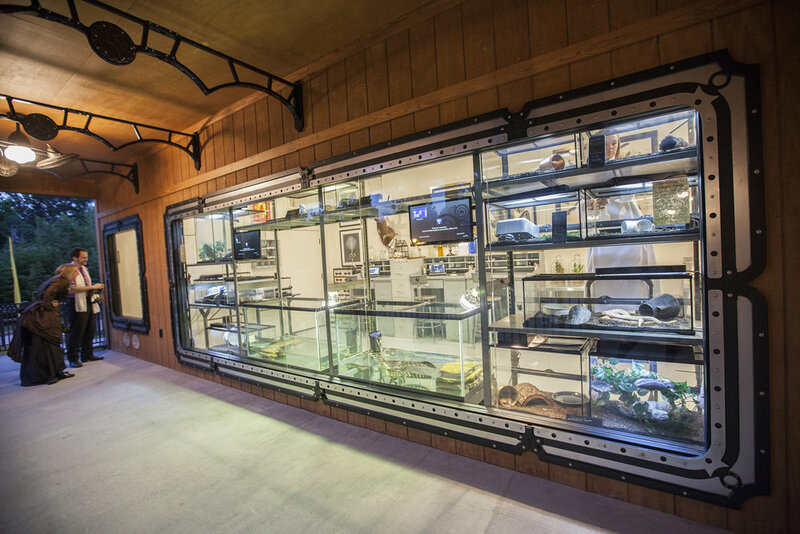 This large window is made to view the reptile exhibit. In the evening it glows wonderfully fromthe inside. 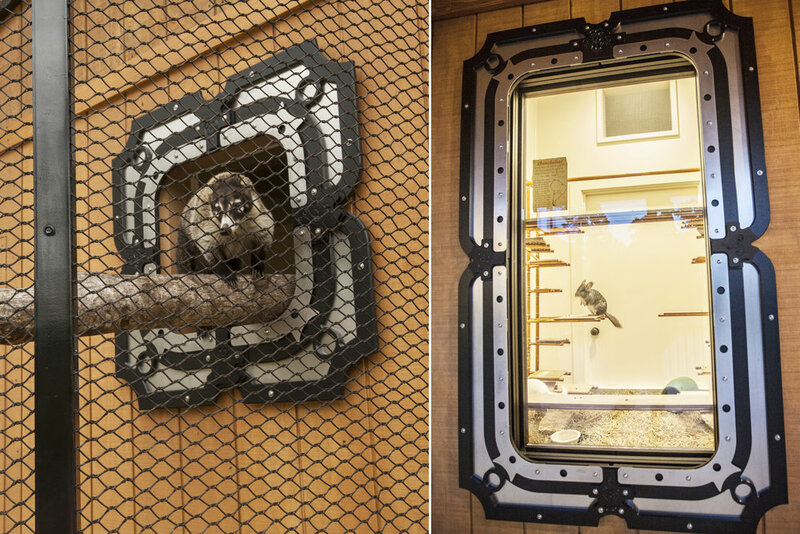 Animal viewing windows and openings everywhere are clad with decorative panels to create a fun and cohesive look throughout the building. The covered walkways lead to the entrance of the Asbury Discovery Center, a meeting and event space with interactive exhibits. 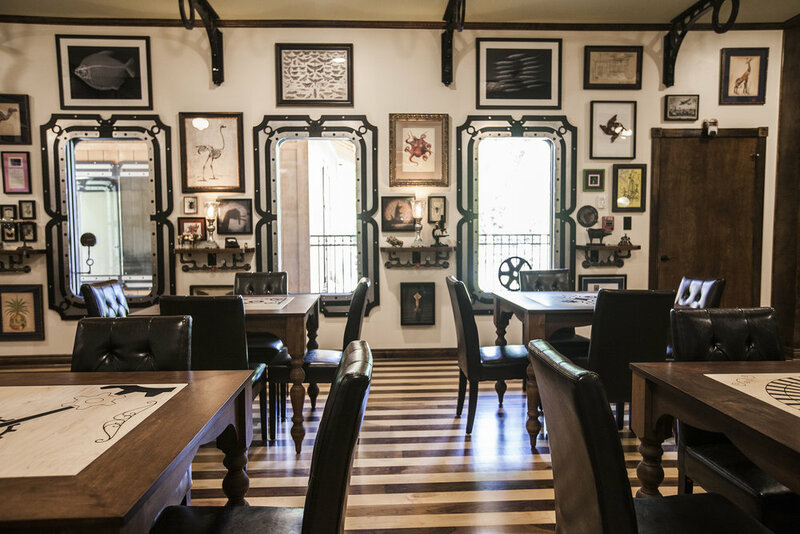 The large room is covered with interest from curio cabinets, art and artifacts to rotating fans above. 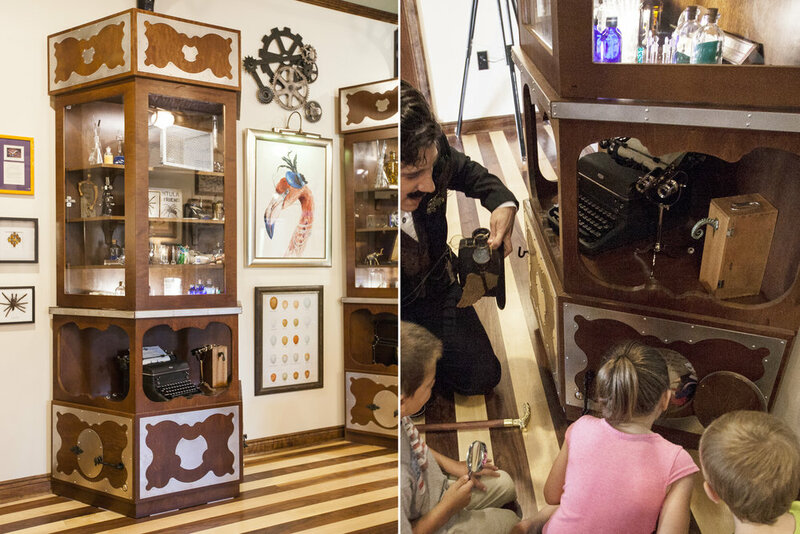 There are interactive areas for children and adults to explore, and even a secret hidden door. Each spanning arch for the interior and exterior of the building has a unique character carved into it. Done in an exterior grade millable signage material, we were able to 3D model and then carve each one at our in-house shop. A field of small intimate tables for lectures and meetings fill the center of the 'Discovery Center'. Each table in the space has a unique center design done in wood and resin inlay. With every nook of the classroom filled with hidden surprises, you'll find something new each time you visit. 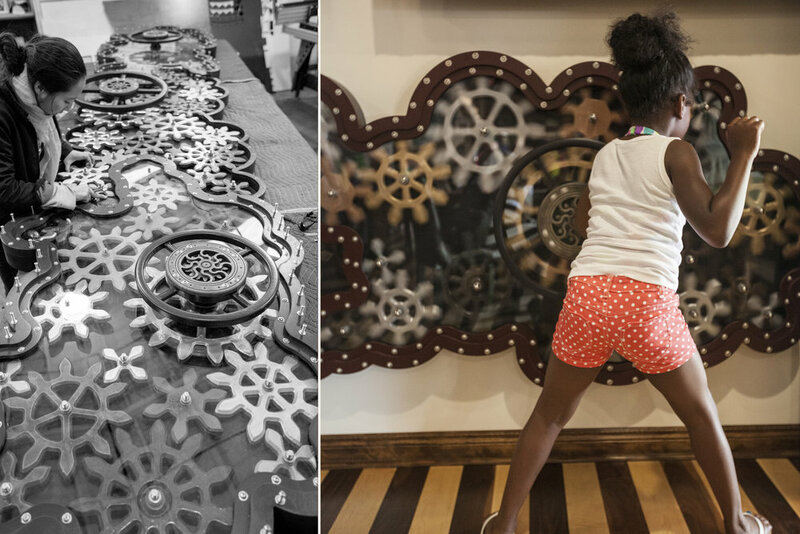 Unlike any other, this "exploratorium" creates a whimsical educational experience for every child and every child at heart. Hand powered gear walls, cabinet doors at child height and fun decorative elements hidden all over, make this space a success with children and adults alike. 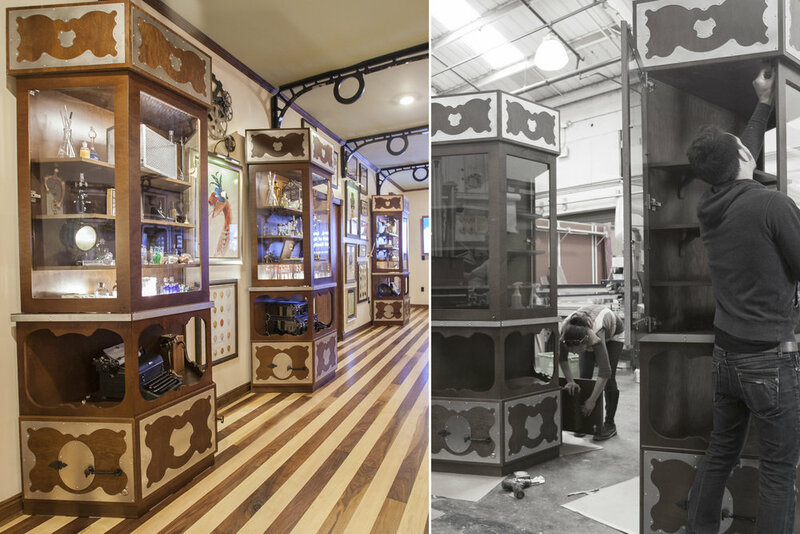 Our fabricator & designer working hand-in-hand to complete the custom furniture on time. 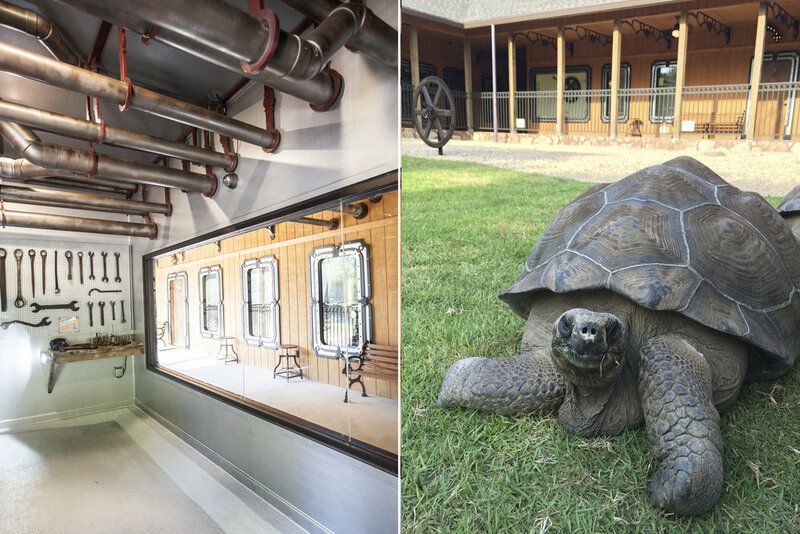 When the Hattiesburg Children's Zoo needed to build a new exhibit house and entertainment space with a Steam Punk flair, they came straight to us. We used the theme as an opportunity to make fun interactive moments for the children visitors. Hand powered gear walls, cabinet doors at child height and fun decorative elements hidden all over, make this space a success with children and adults alike. After realizing the design, we researched and used exterior grade materials in interesting ways. Having to survive a climate that gets both snow and intense muggy heat, we combined plastics intended for outdoor play structures with aluminum, brass and exterior woods. We worked closely with the onsite staff to assure everything would be easy to install. After a few site visits for measuring and design meetings, we fabricated all the elements in our in house shop, then shipped them to Mississippi for their final installation. Lake Terrace, Discover a Revolution at the Hattiesburg Zoo!